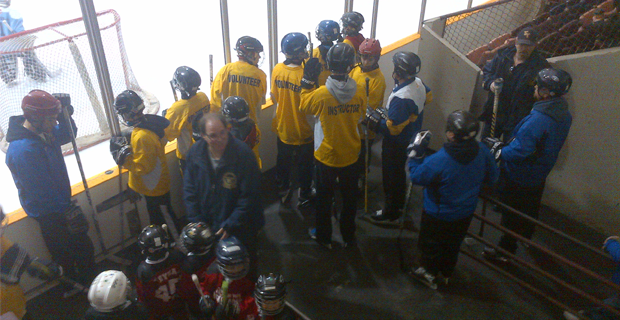 Minor hockey is full of great volunteer coaches. However, as Mike Toth tells us, coaches are far from perfect. Last Saturday was my worst day as coach of the 8-year-old East York Penguins. So, with that in mind, I channeled my inner Tony Robbins to try to awaken the sleeping Penguin within my little lads as we got set for an early morning face-off against the Oilers. "Guys," I said, "all season long, we've talked about going out there and just having fun. But today, I'm gonna be selfish. I really want a win today because, if we don't start playing better hockey, our season ends in a few weeks. Now, I don't know about you guys, but I'm not ready to say good-bye. So let's get out there and get a "W" boys!" I swear Knute Rockne couldn't have done it any better, and my assistant coaches were suitably impressed. "If that doesn't get the boys going," they said, "nothing will." But it didn't get them going at all. In fact, we promptly played our worst game of the entire season as the Oilers pummeled us 8-3 and afterwards, it was all I could do to refrain from delivering a much more loud and angry speech. Usually our post-game dressing room is a fun environment, as the coaching staff hands out hockey cards to the Penguin that hustled the most and the Penguin who delivered the best pass. "Who wins the hockey cards, Coach? ", asked one of our little lads after we got our lunch handed to us by the Oilers. With gritted teeth and clenched jaw, I delivered my reply. "Boys, I can spread baloney with the best of them. But I don't have enough baloney in the world to make a sandwich out of that game. The hockey cards are staying right here in my pocket this week." But while we truly did play awful, the biggest baloney of the day came in the form of my pre-game speech. To be honest, I think I scared the poor little guys. "We're not having fun today? We need to win? If we don't win, our season's probably over?" That's a lot of pressure for a bunch of 8-year-old house league players to digest. All season long, our official Penguins team motto has been "Fun, Hustle and Improve". However, with our team in the play-offs, that philosophy was chucked out the window. All of a sudden, I wasn't Mike Toth, coach of the East York Penguins. Instead, I was more like Dan Bylsma, coach of the Pittsburgh Penguins, trying to entice Marc-Andre Fleury to make a stinking save so we could take a shot at the Stanley Cup. In house league hockey there's usually an entire week between games; a perfect time for coaches to reflect on how they may have messed up the young minds under their care. Forget the Matt Foley "Van down by the river!" routine. The Penguins "Fun, Hustle and Improve" mantra is back in vogue and, win or lose, I guarantee the mood in our dressing room will definitely be a lot better.